The 10-day-long Dalit Asmita Yatra, a march organised by the members of the community and other activists in the wake of the Una incident in which seven Dalits were flogged, wended its way to Savarkundla in Amreli district on Thursday. “This is a fight for our dignity and we have to take revenge from the perpetrators of violence in Una. On August 15, we will give a memorandum to the state government to give five acres of land to every Dalit or face our agitation,” Mevani screams at every halt. “If Hardik Patel can go to jail for nine months for reservation, I am ready to remain in jail for 27 months if we don’t get land from the government,” Mevani says. In the melee of marchers are many from other states. Manisha Mashaal, 27, has joined the yatra, with her sister, Rajni, from Haryana. “ I learnt that I was a Dalit when I was in Class 3. The pain that a Dalit goes through can never be understood by dominant castes. I am telling my brothers and sisters, why do we need dominant caste to support our cause? Why can’t we raise these issues?” thunders Manisha. Among the marchers, mostly activists from Jan Sangharsh Manch (JSM) and Navsarjan, there are workers of Communist Party of India (Marxist-Leninist), Bihar. Its MLA, Sudama Prasad, too participated for a day. Others include Antas Sarvanand, a student leader from Allahabad in Uttar Pradesh, and Chandrashekhar Subramaniam, an activist from Tamil Nadu. The ten-day yatra is led by former IPS officer Rahul Sharma, Nirjhari Sinha of Jan Sangharsh Manch, the civil rights organisation founded by her late husband Mukul Sinha, and others. 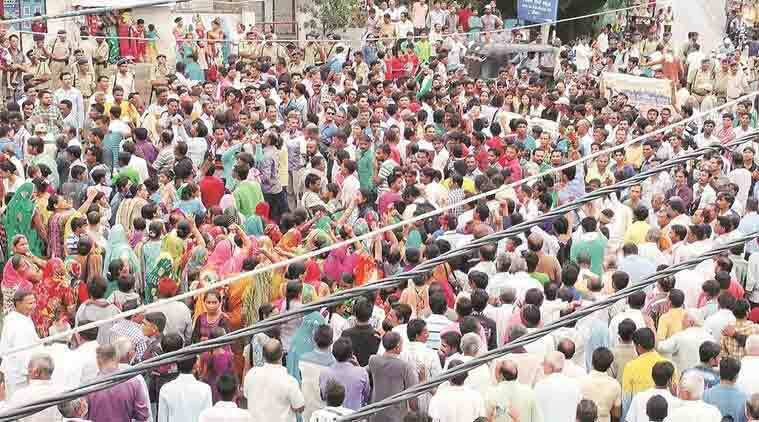 Braving the rain Tuesday evening, over a hundred people, mostly youngsters, almost blocked the traffic in Botad, a town of the newly carved district by the same name, less than three hours away from Ahmedabad city, chanting “Jai Bhim… Jai Bhim.” Another at least a hundred flanked the road, standing on the rooftops, balconies and all elevated spaces they could find to take a glimpse of the yatra. The rain continues and the march which assembled at a Dalit locality of the town garlands the bust of Dr B R Ambedkar. Soon, the march halts at an open land where a stage has been installed and tarpaulin sheets laid on the ground are already wet. But the crowd starts occupying the space and before the floodlights are switched on, the crowd swells up, much to the excitement of the marchers. “This is my karmabhoomi,” says Sharma to the crowd, introducing himself in Gujarati. Sharma was the SP of Bhavnagar district. Botad was a part of the district in 2002 and remained largely insulated from the impact of the post-Godhra riots because of the police action. Sharma, who retired prematurely from IPS, is now a lawyer in the Gujarat High Court. “First of all, this march is not on political discourse. Besides, I want to tell all that this forum is for everyone who is oppressed. There is no other agenda,” Nirjhari Sinha tells the crowd.